The Snuggly Sleeper is BarksBar’s answer to the growing clamor of pet parents for a more comfortable and more elegant orthopedic dog bed. It looks like an ultra-posh lounger that you see in the lobby of a 5-star hotel. The only difference is that the Snuggly Sleeper is not a lounger but a bed for your arthritic canine. The Snuggly Sleeper uses human-grade, premium-quality orthopedic foam to give your dog the support it needs for its joints. 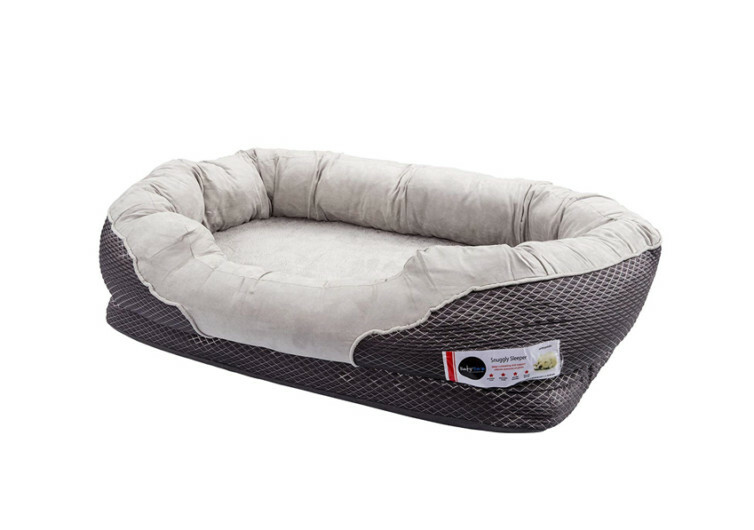 This is very unlike other orthopedic dog beds that sink to the bottom the moment your dog rests its body on it. The Snuggly Sleeper distributes your dog’s body weight in a more even manner. This helps eliminate the creation of pressure points that can lead to pressure sores and joint problems. The 3.5-inch thick solid orthopedic foam is dense enough that it can retain its shape for many years. Surrounding the sides and back of the Snuggly Sleeper are walls with extra-soft cotton padding. It doesn’t have orthopedic foam, yet it does a good job of supporting Fido’s head and neck. There are some dogs that love to have their heads at the same height as their bodies. 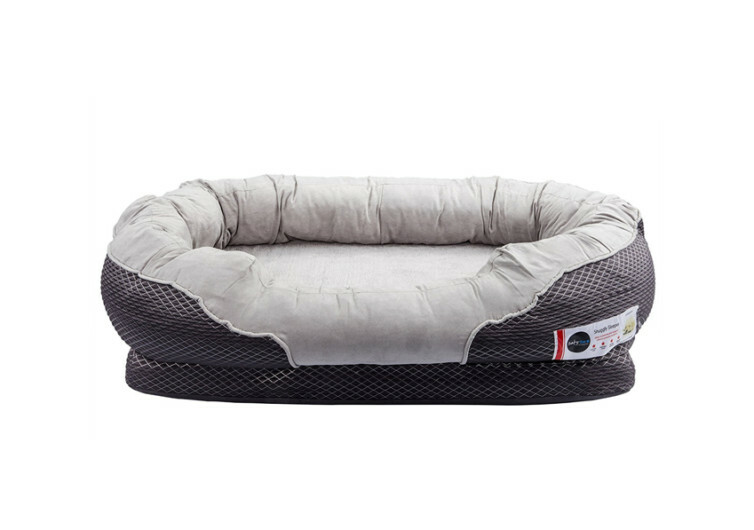 The Snuggly Sleeper’s high side walls make sure your dog gets a more comfortable sleep. These walls also help keep their neck in perfect alignment with their backbone. You’ll be keeping the integrity of your dog’s spine. Providing cover for the Snuggly Sleeper is an extra-soft and plush polyester in quilt design. It looks elegant enough that it can complement any existing home décor. It is also removable for easier cleaning in your washing machine. If you’re not in the habit of machine-washing doggie items, you can vacuum and spot clean the Snuggly Sleeper instead. 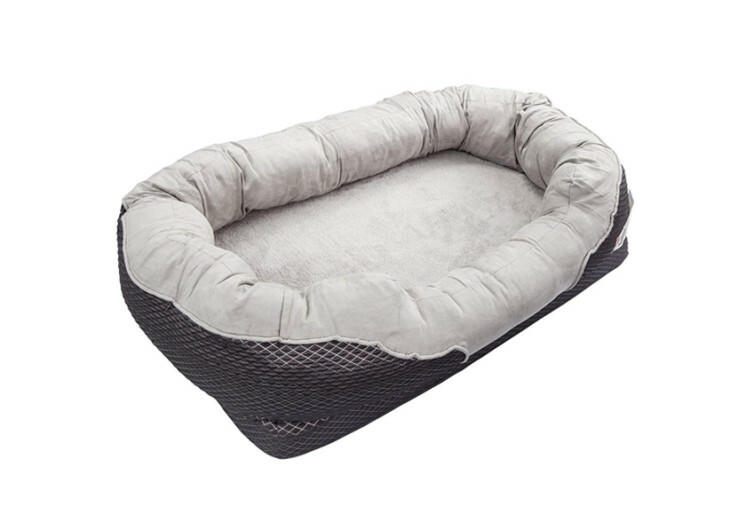 At the bottom of this orthopedic nesting dog bed is a rubber backing that prevents it from slipping. The Snuggly Sleeper only comes in two sizes, though. Its medium variant is perfect for dogs that weigh 50 to 100 lbs. The larger Snuggly Sleeper can accommodate giant hounds weighing 100 lbs and more. BarksBar’s Snuggly Sleeper is ideal for dogs that are sick. It’s also good for those with arthritis and other problems of the joints and muscles. While it only comes in two sizes, you can still have the Snuggly Sleeper as a comfortable bed for two of your small dogs. Its design fits well into the modern home.